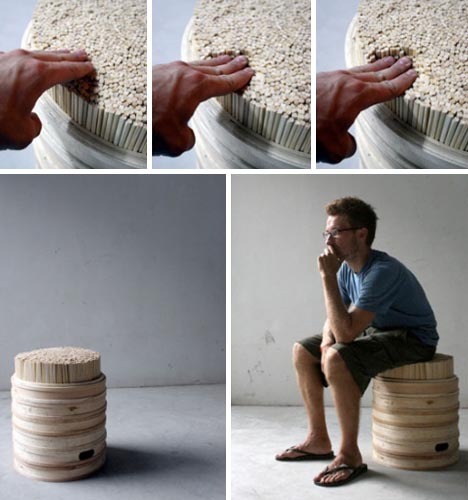 Steamer trays and wooden chopsticks are some of the most ubiquitous trash objects in China – and are thus the perfect to upcycle into something useful and durable at the ends of their short and eventual first lives, like this simple (but also functional and comfortable) wood stool design by B.A.S.E. This hybrid upcycled object is more crafty and comfortable that it initially appears. The stacked steamer trays are light-weight but also critically hollow for a flexible foam insert which can be added in the middle. This padding combined with the free-to-move chopsticks sitting on top make it comfortable to sit on. We simply love this fantastic idea!